Writers, readers, lovers of historical fiction, do I have an announcement for you! Over the next two weeks I will have the amazing opportunity to participate in the book launch for Beyond Her Calling, a historical romance written by my writerly friend, Kellyn Roth. We’ve got guest posts, we’ve got writing advice, we’ve even got a giveaway!!! And to commemorate the occasion Kellyn has written this awesome reference post to help all of us beginning HF (historical fiction) writers learn the basics of researching for our novels. So, grab a hot cup of your favorite beverage and let’s get learning! So, today I’m going to tell you how I researched for my romance novel, Beyond Her Calling (with an emphasis on the historical-y facts I had to look up). I’m going to start by being honest—I oftentimes do a lot of my research while editing! I get the main points down as best as I can, such as a broad understanding of the era, and then I dive right into writing—and worry about what kind of corsets were in use later. However, every novel I’ve written has required a certain amount of research specific to the book (even though I already knew a lot about the Victorian era for previous books). Regardless of what genre you’re writing, though, there are a few things you’ll need to know about the setting of your book. What did people wear? What were the styles and fashions? What did they do day-to-day? Make sure you’ve got these details down for your specific character/character’s class as well as in general. If you figure those out (and I knew most of these things in advance with the exception of some details about Scotland), you’re halfway there. To give you an example, let me answer these questions for Beyond Her Calling’s setting. They’re weren’t callin’ their bae to give them the 411 on that hater. YEET. (I don’t think anyone talks like that nowadays, either. Except in memes. But whatever.) However, neither were they using Shakespearean speech! Definitely read a couple books written during the era to get a feel for it. My characters in Beyond Her Calling live in stone/brick cottages. Many of the characters in my novel are Christian! But here is a random detail about the year I’m writing in (1882). Until that year (exactly), women were considered to legally become nonexistent once they married. (After that things changed a bit as far as legalities go, but that gives you an idea as to what they thought of women.) Basically, find all the juicy opinions-on-people stuff. The politics, if you will. Just get a big-picture view of the world at the time of your novel as well as the specifics of the lives of your characters. Those are the most important things. For Beyond Her Calling, I already knew most of these things (as I said before). I’d already written in this setting with these characters, so I was good to go, right? No more researching required, right? Well, no, I hadn’t covered everything. Because even with your big-picture view, you’ll need to know specific details related to your novel. For me, these were primarily medical (what was college like for doctors-to-be? How many years would it take? What would they learn?) and farm-related (how do you milk a cow? How long would it take? Is it hard? Where did they store the milk in Scotland in 1882? Where would the sheep live? ), but I also had questions about how people spoke. Nailing down the Scottish accents was probably one of the hardest things about writing the book! But where do you find all this information? Well, that can be hard. General guides to the era. You can find those for about any time period. See if you can’t find ones more about how people lived than the politics and wars—though those can be useful, too, depending on your subgenres. More specific nonfiction works. Some details can be hard to find, but they’re out there. Try Goodreads for finding records of them and then search the archives! Books written during the era. These are always the best resources! Read as many as you can get your hands on. Not just fiction, either—old guides to etiquette/courtship/etc. are priceless. Books set during the era. These are great for general facts, though, like you, the author may not know everything. Be sure to double check whatever a historical fiction author says in their novel (no matter how famous they are, etc.). At the very least, though, they will give you an idea of what to research for. The Internet. The internet isn’t always reliable, so always triple-check your resources (my rule is at least three people have to say the same thing), but there are many blogs, websites, online libraries, and other resources to explore. My history geek friends. And I mean that as a compliment of the highest order! It’s always a good idea to get to know a lot of people who love history. Generally if you write historical fiction, you’re one of them, so you can compare notes. But at the end of the day, you can’t know everything. You can only do your best! You can also get away with fudging some information as long as you openly declare that you did so. For instance, I completely made up McCale House from my Chronicles of Alice and Ivy series. To the best of my knowledge, nothing like that exists or ever has existed—especially in the Victorian era where people could be declared insane for too much novel-reading. However, I have been clear that McCale House is a work of my imagination, and so far, no one has complained about the lack of authenticity. Let me know your thoughts/process of researching in the comments! Wow! Does this post make anyone else want to dive right into a dozen historical guides or is that just me? Thanks for the awesome advice, Kellyn! If you learned something new from Kellyn, want to ask her a question about her process, or just want to share your own tips for researching HF leave a comment below. And if you liked this guest post be sure to let Kellyn know by hitting the like button! Double and, don’t forget to check out the rest of the stops on Kellyn’s book launch tour. There’s a lot of great stuff happening over the next two weeks! And be sure to check out the Facebook party every day this week for exciting updates. At twenty, Ivy Knight feels as if she hasn’t accomplished anything of worth. Her life stretches on before her, empty and pointless. Though her faith in God and her mental abilities have been strengthened, she still doubts herself. Does God have a purpose for a socially awkward, often confused and frightened young woman? Jordy McAllen has just returned to Scotland after his education in London. Though he has accomplished a lot for a farm lad such as himself, he fears that what everyone has always said about him may be true: he won’t really make a good doctor. Determined to prove himself, Jordy snatches up the opportunity to become the doctor in the village of Keefmore near his parents’ farm. Helping Jordy with his work at Keefmore seems like the perfect opportunity for Ivy. Still, she doubts herself. Is there a purpose to Ivy’s life? Kellyn Roth lives on an Eastern Oregon ranch with her parents, little brothers, border collies, cats, and a few dozen cows and chickens. Always a lover of a good story, and especially of telling one, she’s been writing since she was seven and published her first novel at fourteen. 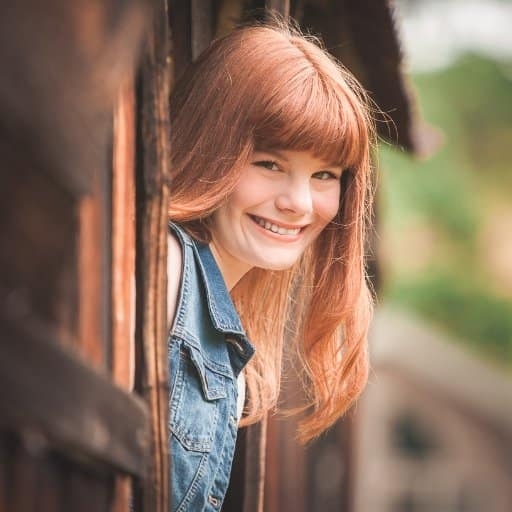 Now a homeschool grad, she divides her time between penning her next Christian historical novel, creating professionally silly articles at kellynroth.blog, and her actual life. Actual life plays second fiddle sometimes, though. Enter the giveaway to win a signed paperback copy of Beyond Her Calling!